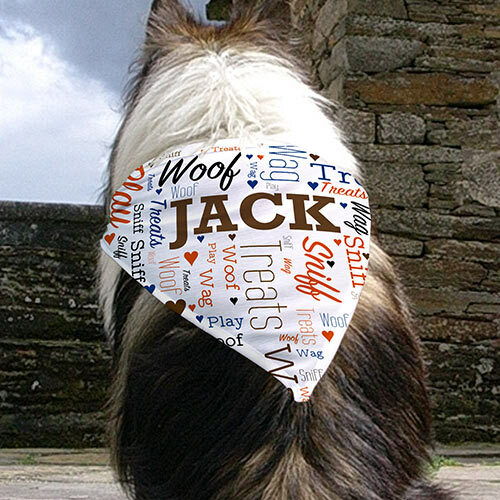 Outfit your dog in this fun and creative pet bandana, designed by you! When you see the Personalized Word Art compilation your like, select the Add To Cart button. This will automatically save your design into your cart. If you would like to see another rendition of your Word Cloud Art compilation simply select the View Your Personalization button again. This will automatically create another version for review. Once you are satisfied with the design, select the Add To Cart button. Materials: 100% polyester, woven material. I loved the product. It is very lightweight and ties easily. Looks fantastic. ❤❤❤ this one! Harley the Bassett hound looked amazing with it on! Would buy again! Very impressed. I like the colors that I chose.